JOHANNESBURG, South Africa (CelebrityAccess MediaWire) — Thieves have pulled off a seemingly sophisticated heist, stealing large sums of money from a stadium following two major concerts over the weekend. 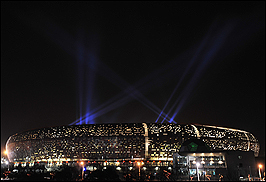 According to Eyewitness News South Africa, thieves struck at FNB Stadium following a pair of concerts by Justin Bieber and Bon Jovi, lowering themselves into a room with a system of ropes and ladders and then chiseling through a wall into a secure room. Authorities reported that $325,905 had been stolen and that most of the money had come from alcohol, food and merch sales. "It wasn't an impromptu incident," Jacques Grobbelarr, a member of the stadium's management team, told Eyewitness News South Africa. "There was definite planning. Looking at the scene and the place they broke into, it looks as if they were planning this for quite some time, probably a couple of days."